Mark Boadey goes hands-on with Yongnuo's YN-622C E-TTL triggering system, a Canon EOS 7D and Speedlite 430EX II. If you read my recent review of the Yongnuo YN568EX speedlight you’ll know that Yongnuo have certainly upped their game and are now producing some quality gear. One of these new breed of high-end gadgets is the YN622C ETTL wireless trigger system. The YN622C allows Canon shooters to fully control their ETTL-ii enabled speedlight from within the camera’s menu system. Think of it like having a 580EXii speedlight on your camera as a master. The YN622C takes the place of a master flash but instead of using a system of infrared signals and pre-flashes, it utilises the 2.4GHz radio frequency to transmit the data from camera to speedlight. This has a huge advantage over the IR and pre-flash as it doesn’t require ‘line of sight’. In fact Canon have only recently adopted this radio trigger system in their 600EX-RT speedlight and this still requires a commander unit. The YN622C gives you all the functionality you’d expect from Canon’s expensive RT system. Full ETTL-ii, full manual control, groups, channels, Multi flash (if your speedlight supports it) and second curtain sync. I’ve tested it with the Canon 430EXii and it works flawlessly, at no point has it missed a beat and I’ve had these triggers a while to have given them a proper workout. 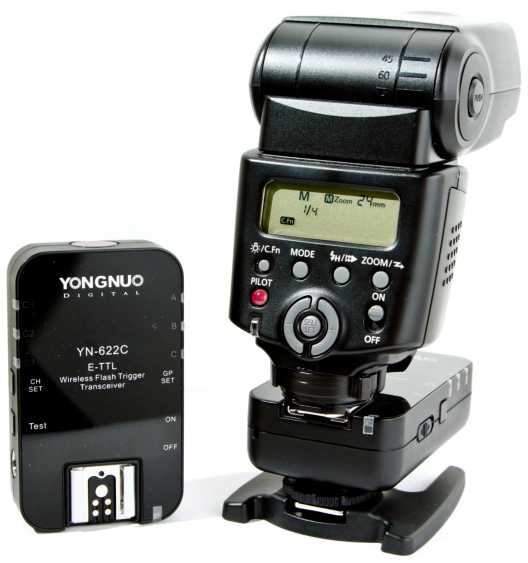 I also tested them with Yongnuo’s very own Speedlite YN568EX and as expected they just worked, no issues, no worries. One of the features of the YN622C has is that they have a built-in focus assist beam. While this is a nice thought, in reality it’s a pile of crap: the beam on my units is way off centre. Luckily for me I shoot a 7D so can autofocus pretty much anywhere. So although the assist beam is crap, the fact that the triggers support High Speed Sync (HSS) more than outweighs that negative. Below is my unboxing video; I also show how the YN622C works with the 7D’s flash control menu. Full manual control in 1/3 stops. I’ve been pretty much delighted with my YN622C triggers. I paid £60 for a set of two; they are cheaper than a set of Phottix Strato IIs, which are purely manual triggers. I can’t tell you how much of a boon it is to be able to adjust power while the flash is in a softbox without having to open up the box, more so it’s up high. I cannot see myself going back to pure manual triggers any time soon. 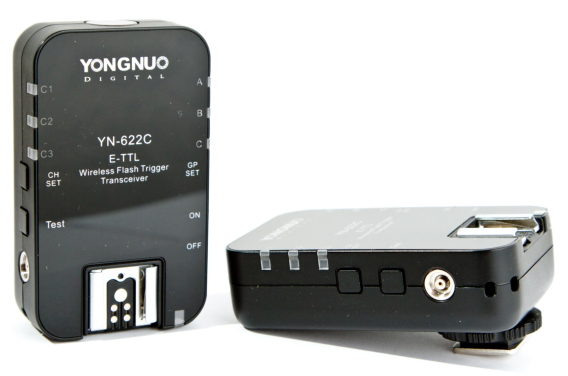 The Yongnuo YN-622C E-TTL Wireless Flash Triggers are available now from Amazon UK (£60) and Amazon USA ($90). You can also find them on eBay US or eBay UK. Mark Boadey is a portrait photographer based in Prescot, near Liverpool in England. He runs the New To Photo web site, “Your guide to learning photography”. See Mark’s portrait work at markboadey.com.